While on my mission, my father met with me one day(Sunday 29th Nov 1981) to show me a newspaper cutting from ‘The Star’ paper of an article by a lady known as Queeny Chang who published a book entitled, “Memories of a Nonya.” He had the book in his hand which he had purchased and showed it to me. The book was about her ancestry and contained a pedigree chart. From this I could tell that Queeny was my grand aunt. She and my grandfather “Kung-We” were cousins i.e' my great grandfather, “Yong-Hian” and her father “Ah Fei” were brothers whose surnames were Chong, Cheong, Tjong or Tjoeng depending on the translations to English by sound from the original Chinese character of which dialect and country of the Chinese people were being used in South East Asia. These multiple dialect were more common in Malaysia, Singapore and Indonesia. 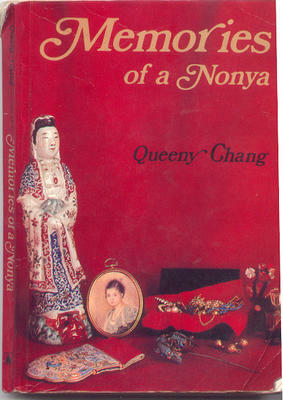 Her book, written in English, gave explicit details of our ancestry that came from China who first migrated to Dutch Indonesia where they prospered to later spread to British Malaya and elsewhere after. This discovery brings to my recollection my patriachal blessing which after assuring me that I will have the close companionship of the Holy Ghost, stated that he will assist me as I search my genealogy and I will experience the joy and blessing of bringing salvation to my kindered. I could truly see the gradual fulfilment of my patriachal blessing when I decided to devote my time to seek my roots after my mission.